Based on and companion to the award-winning DVD and video series from Alan Parsons. • Extended interviews and observations from peer engineers, producers and artists. understand about recording music the more you can contribute to the process, and in my experience, the more sheer enjoyment you’ll get out of it - whichever side of the glass you’re on." - Nick Mason, Pink Floyd. Based on the award-winning DVD and video series, The Book tackles the same soup-to-nuts list of modern recording topics but in completely re-written and revised form. Legendary artist, producer and engineer Alan Parsons, who's career began in the 1970s working at Abbey Road studios in London with The Beatles, takes you on a journey from how sound behaves and is created, through all forms of sound processing, to all aspects of recording including equipment and different types of instrument; concluding with a final mix. Written with long-time cohort and Keyfax NewMedia CEO, Julian Colbeck, The Book addresses topics in readable and entertaining style: technical, but nonetheless understandable by anyone with even a passing interest in recording. As with the DVD and video series, one of the many unique aspects of The Book are the peer group interviews, personally conducted by Alan Parsons. When they speak to fellow engineers, producers, or artists, people open up and are happy to discuss the intricacies of their art and craft. What were only sound bites in the video series The Book offers in extended format so you can really get to know the thoughts of Erykah Badu, Michael McDonald, Rami Jaffee and countless others. 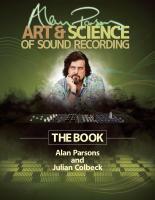 Alan Parsons' Art & Science Of Sound Recording - The Book provides you with a unique perspective on modern recording, coming from a man who recorded Dark Side Of The Moon on 16-track analog tape but who currently works with DAWs and plug-ins and even records over the internet. The authors present the full expanse of modern recording tools and techniques and yet are fully aware of where and how those tools and techniques came from and what their original purpose was. Such depth of knowledge doesn't just give you the button pushes, it goes on to let you truly see and learn the art and craft of recording.